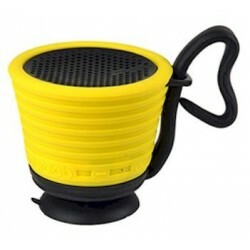 "Fall in love with music again" with the beautiful Romoss "Romio" Bluetooth Light Speaker. Compatible with all Bluetooth enabled devices that allows you to easily connect to your devices within (10m)away. Compared to Bluetooth 4.0, Bluetooth 4.2 enables 250% faster over-the-data transmission and 10x more packet capacity, which could keep "Romio" running more smoothly and pairing much faster. Enjoy the high definition stereo sound, realised through the dual high-performance driver and a unique passive radiator. With 9 multi-colour LED light modes, "Romio" could be used as a portable LED baby night light, night lamp as a nursery decoration, romantic mood lamp, dim bedside lamp, desk lamp and more. Everyone needs a "Romio"!